After a successful debut season in 1985, ECAR grew to nine races in 1986 and attracted some important young talent. Canadian Scott Goodyear had been making his way up through the SCCA ranks, impressing in Trans-Am, but this was his first season of professional racing. Englishman Calvin Fish had been through the traditional British ladder of Formula Ford and Formula 3, but his timing had been unfortunate, arriving in F3 at the same time as Ayrton Senna and Martin Brundle. Despite a win at Oulton Park, his F3 opportunites dried up and he moved to the US where some impressive drives in Vicki O'Connor's Pro Sports 2000 series in 1985 won him in a season in husband Bill's Formula Atlantic Ralt for 1986. Goodyear and Fish dominated ECAR in 1986: Goodyear winning six races to Fish's three, and Goodyear also took pole position five times. 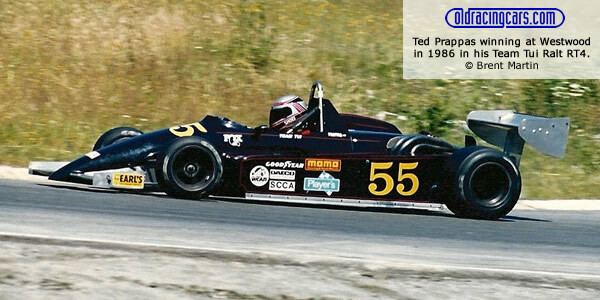 The Canadian attracted the attention of the CART teams and became Atlantic's first CART graduate since Michael Andretti in 1983. Fish stayed with the O'Connor's for another try at Atlantic in 1987. Of 189 race starts in the east, 156 were in Ralts, 27 in Marchs, four in Chevrons and two in Tigas. As the series became more professional, so the cars were getting newer: 67 starts were in cars built in 1986 (or purported to be), and a further 25 from 1985. The bulk of the Ralts were from 1981, 1982 or 1983. Apart from the two 1982/83 Tigas, the youngest non-Ralts were March 81As. Class B was won by R Peter Gates in his March 81A with three wins and two second places from six starts. However, it was Cliff Ebben in another 81A that deserved much of the credit as he was fastest qualifier in all five of the races he contested, failed to start one but won the other four. All North American Formula Atlantic results have been compiled by Chris Townsend. For the WCAR/ECAR period his primary sources have been On Track magazine, Sports Car (courtesy of Kevan McLurg), and Autoweek. Results sheets, entry lists and qualifying times have been kindly provided by the late Murray McLaren, Tim Fortner, ECAR Series Chief Steward John W. Bornholdt and Jerry Winker. We are also grateful for the help of series organiser Vicki O'Connor, and John Zimmermann. Most of the cars to appear from 1983 to 1988 were Ralt RT4s but Ralt's production records usually only give the name of the agent. Swift build records, courtesy of the late Murray McLaren, give more detail. Second and subsequent owners have been determined from SCCA log books of owners too numerous to identify individually or from references in On Track to previous owners. More help is needed - if you owned one of these cars or raced in the series, please get in touch.